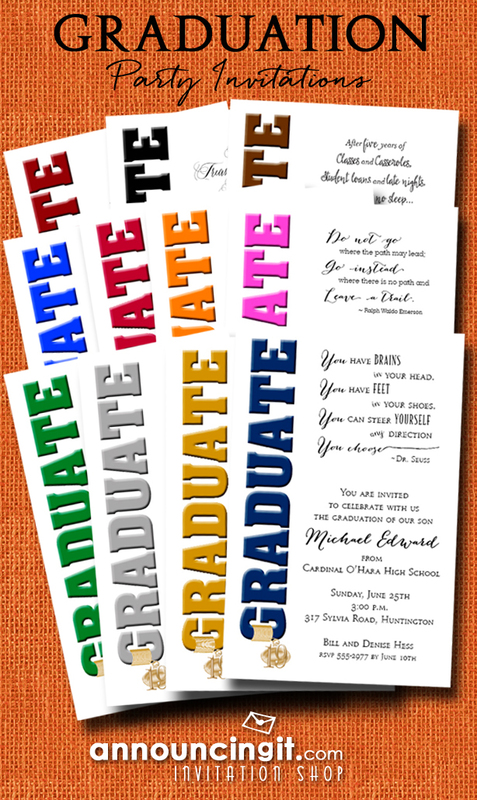 A grad cap tassel charm hangs from the bottom of the word GRADUATE in your choice of colors for graduation party invitations and announcements. Available in gold, silver, red, blue, navy blue, black, orange, green, hot pink, brown and burgundy. This entry was posted on Wednesday, April 17th, 2019 at 5:16 pm	and is filed under Graduation, Invitations. You can follow any responses to this entry through the RSS 2.0 feed. You can skip to the end and leave a response. Pinging is currently not allowed.